Mail4Rosey: #SickJustGotReal $25 Target Gift Card, 20th Century Fox DVD, and Pfizer Pediatrics Prize Giveaway! #SickJustGotReal $25 Target Gift Card, 20th Century Fox DVD, and Pfizer Pediatrics Prize Giveaway! Pfizer Pediatrics and a giveaway for you! My youngest and I have been knocked out by the 72-hour flu. It totally ruined Valentine's Day, made my son miss one night of his weekly sport activity, and one of his dance lessons. He did not like missing his dance lesson at all. The boy has a new love of football that is unquenchable, but it doesn't top his love of dance. Right now he's in Hip-Hop and loving every second of it. Missing that block of time really bummed him out, but he knew he couldn't make it, and he knew for sure by looking at his mama too, that there was no way I was fit to drive him anywhere, period. We really had it bad! 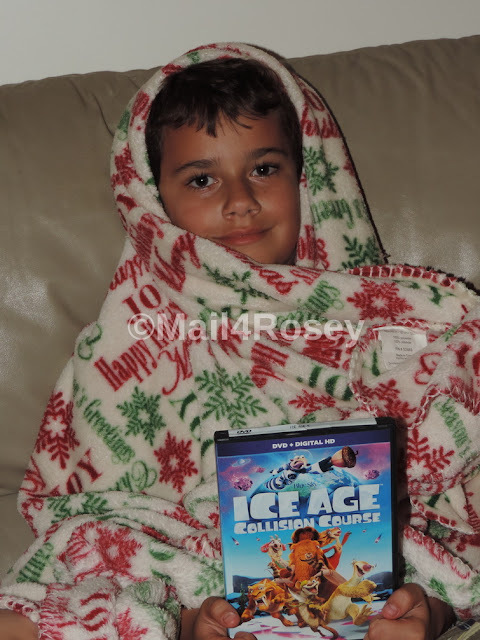 Fortuntately, when we started to come around again, and feel at least good enough to sit up straight long enough to watch a movie, we had the new Ice Age Collision Course movie to help lift our spirits. My son snuggled up in his favorite blanket (which happens to be one my daughter gifted to me a couple of years ago, but he uses it so much, you'd never know it was mine), and popped in the movie. I felt good enough to lift the camera, and voila' a blog post was born! The movie was hilarious, and just what we needed to lift our limp, sick spirits. Of course no sickness could run it's course without one of our favoirte Pfizer products, available at Target. My youngest, who is 9-years-old used the Children's Advil® on day one to reduce his fever. I always trust Advil® when his temperature is up, because it always works fast, to bring it down, just as it did this time around: it's always perfect for symptom relief. On days two and three, we had both the Robitussin® and Dimetapp® in the house and we went with the former, simply because it was already opened. We keep these items in stock always, and for good reason. When you're sick, you don't want to go out, period. If these items are on hand, you're already set. There are some things you really do want to be proactive about, having the right children's medicines in the cupboard/cabinet, is definitely one of those things. Hurry in to Target to pick up the following items, and save 10% with the Target Cartwheel App! If you haven't tried this app yet, you really need to give it a go. Saving is always good, and with this app, it adds up very quickly! Formulated just for kids, Children's Robitussin® Cough & Chest Congestion) non-drowsy daytime formula helps break up chest congestion, for ages 4+. One lucky Mail4Rosey reader will win a $25 Target gift card, an assortment of Pfizer Pediatric products [Children's Advil® Suspension, Grape, Children’s Robitussin® Cough & Chest Congestion, Children’s Dimetapp® Cough & Cold] and (1) randomly selected 20th Century Fox DVD (Ice Age: Collision Course, The Sandlot, The Peanuts Movie). Hurry to enter though because this giveaway runs one week only! Good luck to all who enter! US entrants only. I've never used the Target Cartwheel App (don't have a smartphone). Familiar with these product though. They work great and my kids don't mind the taste. I like the Target Cartwheel app because it has 10% off the cold medicine and it is always great to save at Target with their app! Cartwheel saves me lots of money! We have used these for years. We use dimetapp for the allergy times and then switch to the Robetussin for the more severe sick times. We tend to get pretty good results with them both. My nearest Target is a hour away, I leave in the country. I learned years ago to stock up on meds because there are no 24 hours stores near me . Waking up in the middle of night with a sick child is the worst with no meds on hand. I use the cartwheel app all the time! It saves me lots of money! These are all what I go for when my kids are home sick! I give my kids the Robitussin Children’s Cough & Chest Congestion in the grape flavor when they are sick. Children's Advil is a great product. Whenever my kids are sick, I know that I can rely on Children's Advil. Love the cartwheel app, it is a saver! Ugg, the nasty flue sure ruins a lot of fun. But good when one can sit up and relax with a movie run. Hopefully he's soon dancing and tackling away. The cartwheel app is great for in-store savings. i love target cartwheel i love to scan to see if i have any extra savings on top of coupons etc!! Get well soon. Being sick is not fun. Your son is still very handsome though. I've used the Cartwheel app in the past. I am so bad about remembering things like that! Hope that means you're both feeling better. I use the Target Cartwheel app often. It's one of my favorite money saving tools! When my kids were young we used Dimetapp. Now they have children's Advil which really works. My grandson is very fussy when it comes to taste, but all of these are on his approved taste list. LOL The movies are all excellent. I would love all of them. When we have a sick little one, we usually try to make sure they get plenty of fluids, medicine as needed and cuddle and have some chill time with some movies. Perfect combination! I use these products when my kids are sick and I use the Target Cartwheel weekly. It helps me save money. These are such great products to use when the kids get sick. The app is a great way to save. We use Children's Advil for my grandsons and it really works well on bringing their fever down. I love the Target Cartwheel app! It save me a ton of money each week! Sickness has invaded my daughter's house as well. She and Clara have been sick, my daughter more so. We loved Sandlot. This is an older movie that is a classic by now. The cartwheel app has helped to save me so much money! I love that I can scan anything while I am in the store and see if there is a discount. I like to use the Children's Advil on my son when he has a fever. I use the Cartwheel app all the time at Target. I like saving extra money. I love to shop at Target all by myself. It's so much fun to walk up and down the aisles ALONE! I haven't used the Target Cartwheel app yet, but I'm going to start using it. These are great products to have in the med cabinet. I have always used Children's Advil for fever. I like and use Target Cartwheel App weekly, very convenient instead of clipping coupons. I have used children's Advil and I think it really works great. I have been using the Cartwheel app for several years and have saved a lot of money! I have been using the cartwheel app for years and have been able to score some great deals. I've only ever used the Target cartwheel app once, but it was nice! I just have to say that when I was a kid, I slightly looked forward to getting sick because I liked the flavor of Dimetapp. I use Advil when my kids or I get a fever. It works great! My granddaughter has just reached the age where she'll sit spellbound by a great movie. I'm dying to show her Ice Age. And after a week at daycare, you KNOW she'll need the cold products! I keep a variety of medication at home. I enjoy using Target cartwheel to save money on these medicines. I love advil. I have always been able to count on it. We always keep Pfizer on hand for when Sick Got Real. Thankfully, we've had a mild winter. Only Allison got a slight cold. I can't wait to see the new Ice Age movie. We missed it at the theater so I'll have to Redbox it soon! I have Children's Advil in my medicine cabinet for when my son gets sick. I love the Cartwheel App. It saves me a lot. I like the Target Cartwheel App. It saves a lot of money. I love the target cartwheel app. There are so many savings people without it dont know about. I like using the cartwheel app. I've used the Cartwheel app a few times. I'm big fan of Dimetapp. My doctor told me about it for my daughter and it's the only thing that helps with her allergies and cold. thank you! I'll have to check out the Cartwheel app. That's a great giveaway. Nothing makes you feel better when you're sick than a good movie. I love using the Target Cartwheel App. It saves me the most money at Target, especially stacked with Target and manufacturers coupons. We always have Children's Advil on hand at our house. I use the Cartwheel app all of the time when I am shopping at Target. It saves me a lot of money. I love the Cartwheel app-it makes shopping at Target fun and easy! Childrens Advil and Dimetapp Cough and Cold are ALWAYS in our medicine cabinet!I always have them on hand, because I know they work, and I can depend on them to help my babies feel better :) Our children are 13, 6 and 3, and we shop at Target all of the time. We love that it's a one stop shop, and they always have the best clearance! The app sounds like something I need to get it. I go to Target often. Isaak loves Ice Age. Hopefully you guys feel better now! Dimetapp is a must in our house! My kids won't take anything else. I think it has something to do with how well they mask the medicinal taste. I love these med products, have them in stock now. I love to grocery shop at Target. They usually have good selection of gluten free. This past week we have been dealing with sickness left and right. We actually have used all these medicines. I love the Cartwheel app. It saves me money and that makes me happy. I haven't tried the Target Cartwheel App but 10% off is a great savings :) I'll have to check it out! I don't use apps because I do not own a cellphone. I do love target though and we always use the robussin cf and dm around here. It is the only cough formula that works. I love the Cartwheel app! It has great deals. I've heard of the Cartwheel app but never have enough storage or data to download. I know it used to be really good. We us Children's Advil whenever my Granddaughter is sick. These items would come in very handy during those sick days. I usually end up getting Dimetapp. And I've thought about utilizing the cartwheel app more. I love the cartwheel app, especially since they just added coupons into the app. No longer do you need to text for a link to their awesome coupons! Love the cartwheel app - helps me so much! How did I ever live without the Target Cartwheel? I downloaded it recently and have saved a ton of money!! I wish everything didn't have apps now. I had it, but when I got the newest phone (*remember I have had several die on my lately) I have yet to upload all the apps that I once had. I feel like I need a phone JUST to have all my apps downloaded. My kids and I were just sick and Robitussin was such a relief to all the coughing. It was nice to be able to sleep! We use the cartwheel app every time we shop at Target - we save extra money. I go to Target almost every week and I need to download the cartwheel app and start using it to save money. I love that Target has another way for me to save money! I always use cartwheel when at Target. I love the Cartwheel app, it helps us save so much at Target. We always have these brands in the house so we are ready if someone gets sick. I've never used the carwheel app....i don't have a smart phone. We missed this Ice Age in the theaters. Definitely want this for myself! These look like pretty good movies. It's always a good idea to have some medicine in the house in case someone gets sick. You don't really want to have to run to the store then. It's that season! Glad to see you found something that works. I give my son Children's Advil when he is sick. I absolutely love the Cartwheel app. I have saved close to $100 while on my shopping trips to Target. It is just so easy to not clip coupons. We shop at Target every few months. I love the target cartwheel app -- it's such a great money saver and pro tip: look at "ALL" products and sort by discount to find the best deals!!! It's always good to have a new movie to watch while your sick and curled up on the sofa under a warm blankie. ive heard of the cartwheelapp. but ive never used it. A few weeks ago I used the Cartwheel app in conjunction with a sale and some printable coupons to score the best deal on soda I've ever seen! It was 4x 12 packs of pepsi for $2 TOTAL! It was the first time I'd used Cartwheel, but now I check it a few times per week to see what kind of great discounts I can find at Target. My granddaughter always feels better cuddling and watching a good movie. I love Cartwheel & I love having Advil around when the kids get body aches & fevers! When my grandbaby is sick, she always like to cuddle and watch a good movie. What a great giveaway. Tough to be sick but especially not fun on Valentines day. Always good to keep things on hand for those unexpected down times. I often use the Cartwheel Target app. I use the Cartwheel app all the time. It saves a lot sometimes. I am new to the Cartwheel App but am learning how to best utilize it . I do trust Robitussin and Advil products for my family. These are great for kids when they are sick. I've never heard of the Cartwheel app before. I shop at Target for housewares!!! I love the cartwheel app and always buy my cold meds at Target. We recently had to buy the Children's Robitussin for my daughter when she got sick. It worked great for her! I'm not sure about the Target app, but I know we love Target! I also love Dimetapp. I remember taking it when I was younger and the flavor was actually good. That's one of the reasons I give it to my kids. I love the cartwheel application, it saves me so much money. I like the deals on the cartwheel app. I have to use this cartwheel app more! The Children’s Dimetapp® Cough & Cold has always been a staple in my home. We use Children's Advil with my grandchildren, it really helps with fever, and keeps it gone. It also must not taste real bad because they both do not mind taking it. I use Robitussin, so I would trust it to use with my grandchildren as well. It is extremely important to use good quality products such as these for your children because children specific medicine is necessary to keep children safe. I haven't tried the cartwheel app. I'm new to this smartphone stuff. I use the cartwheel app all the time it is a great savings tool. I love the cartwheel app. being able to scan products for extra savings is wonderful. I go to Target rather frequently - it's less than a mile away. I don't know anything about the Cartwheel app yet - I just bought my first smartphone earlier this week, and I haven't tried adding apps to it yet. I'll get there! I absolutely love using Cartwheel - I save a ton of money on items already on sale! I love target. The cartwheel app makes it easy tosave money. Thanks for the giveaway. I used to use the App a lot but mostly I forget. But it is a good app. I love the Cartwheel app! Target is the best and the cartwheel app makes it all the better! We have been buying a lot of Robotussin lately, with everyone being sick! The Target Cartwheel App has saved my family hundreds. my kids havent seen this movie yet and love ice age! BEDDI Charge for Valentine's Day!